We are Shared Future. We're committed to community empowerment, social enterprise and democratic participation. We're all about providing expertise, building connections and delivering worthwhile projects. We work with not-for-profit organisations, the public sector and ethical private companies. Shared Future is a social enterprise with a mission - to support other social enterprises. We can help individual enterprises grow, and we deliver innovative social enterprise support programmes that can improve a whole community. From citizen juries and inquiries to community-led design, we are committed to community engagement. We connect people and then support them to take action. We're serious about participation at Shared Future - encouraging citizens to become more active and influential within their community, their city or society. 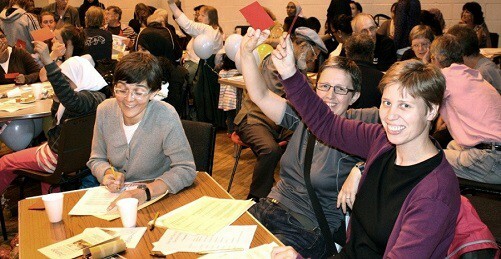 We're UK leaders in the field of Participatory Budgeting. Shared Future are leaders in the fields of Participatory Budgeting and Citizen Inquiries/Juries. We can also provide expert advice on Community-Led Planning, Community Empowerment Projects, Ethical Business and Social Responsibility, plus many other areas. Since Shared Future was founded in 2009, we've built a successful team of experienced consultants and practitioners who offer a diverse range of skills. We work together on worthwhile and stimulating projects that reflect our personal values.